What is for dinner tonight at your house? 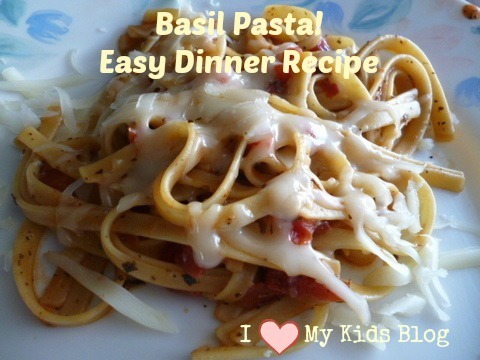 We are having Basil Pasta! It tastes as good as it looks! Yum! You can SEE the flavor on those noodles! I found this recipe a few weeks ago on Facebook, it was titled “Blow Your Mind Basil Pasta” I have shortened the title to just Basil Pasta, but you can call it whatever you’d like. 🙂 It is a simple dish that you just “throw in”, stir, and viola a fabulous meal in less than 30 minutes! We have eaten this 3 times each week in the last 3 weeks—we LOVE it that much! This is super simple to “throw together” meal. What I love about this recipe is you can control how spicy or NOT spicy you want it based on your canned tomato choice. This is what I had on hand, so we used this and my mind was seriously blown with it’s awesome taste! 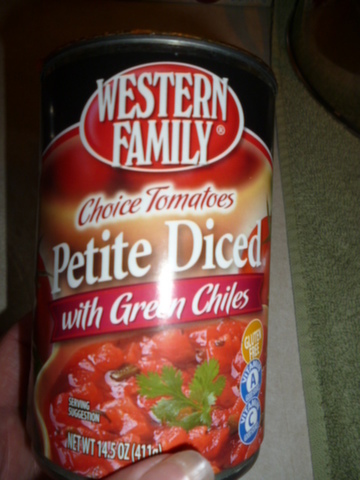 You can use whatever tomatoes you want, this is what I had on hand and it was delicious! 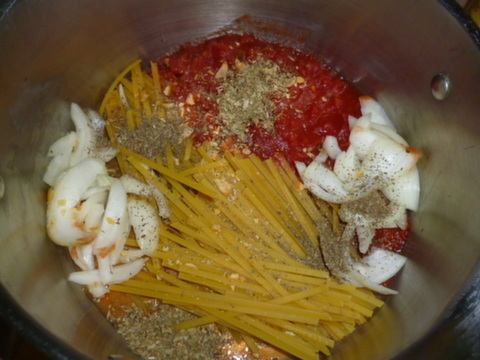 Place pasta, tomatoes, onion, garlic, basil (fresh or dry), in a large stock pot. 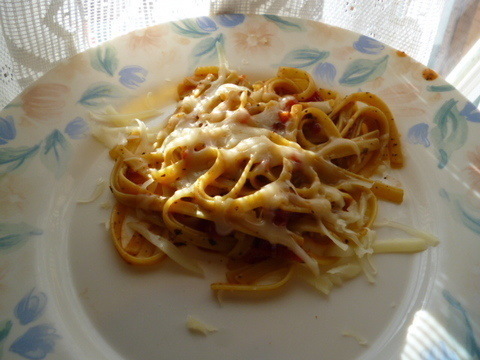 I broke my fettuccine in half…to avoid my little ones slurping huge noodles! Pour in chicken broth. Sprinkle on top the *pepper flakes (*Optional-I did not use since I used spicy tomatoes) and oregano. Drizzle top with oil. It may not look super appetizing right now, but JUST wait! Cover pot and bring to a boil. 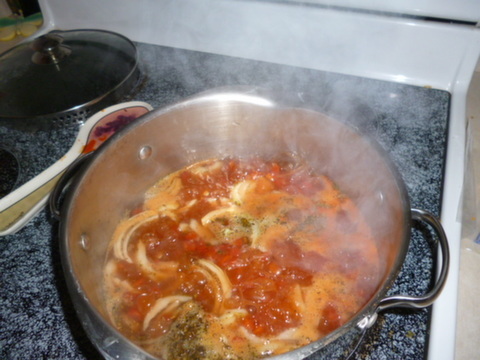 Reduce to a med-low simmer and keep covered and cook for about 15 minutes, stirring every 5 minutes or so. 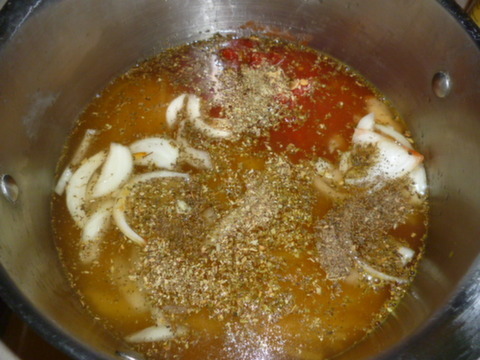 Cook until almost all liquid has evaporated – I left about an inch of liquid in the bottom of the pot – but you can reduce as desired. If you try this recipe I want to know what kind of tomatoes you used and if your family loved it too! Sorry wish I could give proper credit for this recipe-but it was just a personal friend’s post on her personal page that she had shared from a friend of hers…SO BIG thank you and credit to the original creator of this recipe! What a super one pot meal you simply can’t go wrong their. I tried this recipe and its amazing. My husband even love this. We are having this tonight. I put ground turkey in mine and I use regular diced tomatos. My family is not a spicy people. The Trukey makes it good, the flavor is amazing. Try this recipe. You will love this.